Not every cool idea is necessarily a great idea, and that’s never more apparent than in director Guy Moshe’s genre mash-up, “Bunraku.” Set during a post-nuclear future where guns have been banned but swords, knives and pretty much anything else with a sharp edge is still fair game, the film takes place in a neon-drenched city controlled by a warrior named Nicola (Ron Perlman) and his gang of killers. When two drifters (Josh Hartnett and Japanese pop star Gackt) arrive in town with their own reasons for wanting to take down the tyrannical crime boss, they serendipitously cross paths at a local bar and decide to team up to increase their chances. But before they can get their shot at Nicola, the warriors must first face off against all nine of his elite assassins. 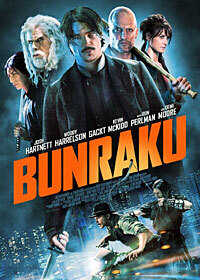 The first thing you’ll notice about “Bunraku” is that it has a very distinct visual style that falls somewhere between the graphic novel aesthetic of “Sin City” and a children’s pop-up book; not all that surprising considering the film’s title is a reference to a form of Japanese puppet theater. The action sequences are also fun to watch and benefit from the film’s unique look, but unfortunately, they never amount to more than a series of flashy distractions to hide the fact that there isn’t much of a story. And when Moshe does try to slow things down in order to develop his characters, he’s forced to rely on some dreadful dialogue that not even reliable actors like Woody Harrelson, Kevin McKidd and Demi Moore can improve. The best you could say about “Bunraku” is that it would make for an entertaining late night movie when nothing else is on TV, because this self-serving piece of fanboy drivel is not even close to being as good as it pretends to be. 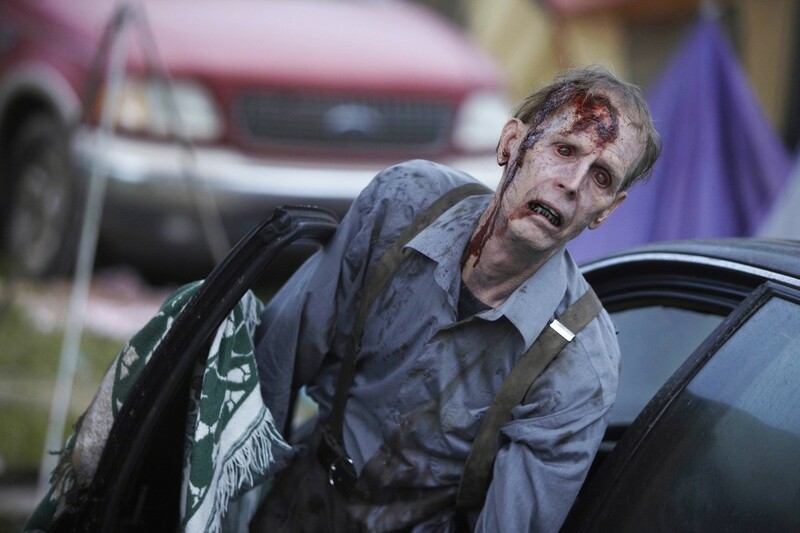 When I met with Nicotero and last Summer’s Comic-Con, however, it was to promote the already highly buzzed new AMC series, “The Walking Dead,” which reunites Nicotero with writer-director Darabont in an adaptation of Robert Kirkman’s Eisner Award-winning comic book series. Premiering Halloween night, the show will be taking a more dramatic look at the cannibal zombie mythos originally created by George Romero in his 1968 “Night of the Living Dead,” combining slow-moving zombies with the kind of in-depth characterization and complex yarn-spinning that’s making the onetime “vast wasteland” of television into something more like the last refuge of classical storytelling. There’s only one problem. I’m kind of scared to actually watch the thing. 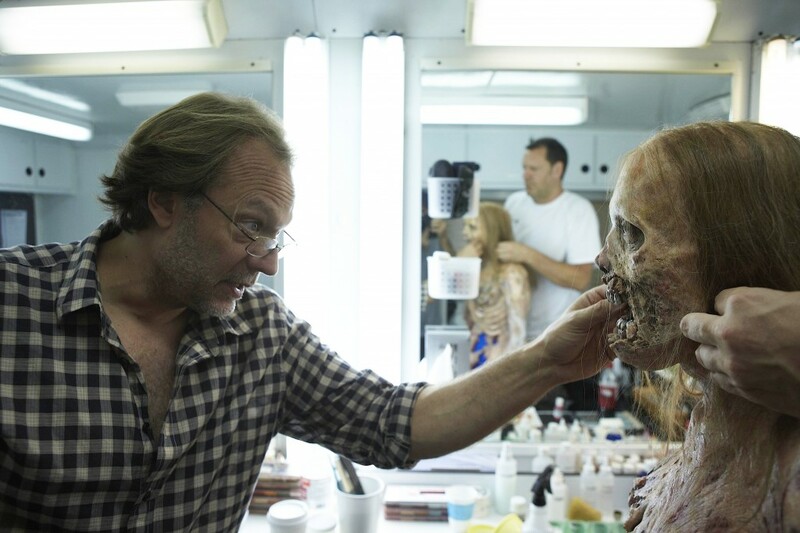 You see, much as I admire the craft of someone like Greg Nicotero, I’m not exactly the usual gorehound media-fan for whom the more, and more realistic, cinematic gore he can create, the better. There was no point in hiding it. Moreover, thanks to the volcano, the next morning, instead of my Crunchy Raisin Bran and 1% milk, I was instead being buttered up by with French toast and applewood-smoked bacon buffet at the Four Seasons, a free Iron Man action figure, and a theoretical chance to ask a question of the all-star cast of “Iron Man 2” — i.e., Robert Downey, Jr., Gwyneth Paltrow, Scarlett Johansson, Don Cheadle,and soon to be super-villain of the year Mickey Rourke — not to mention director/co-star Jon Favreau, writer Justin Thoreaux, and producer Kevin Feige. Of course, considering the 150 or so people in the room, I wasn’t surprised that I didn’t get to ask any questions, but it was a pretty entertaining event. Robert Downey may have famously given up a number of vices, but being a perpetual class clown does not seem to be one of them, and it wasn’t like he was the only interesting person in the room. The first question, about whether Favreau or he felt any pressure in terms of living up to the success of the first “Iron Man,” set the tone. Favreau admitted he had never been involved with a sequel before, unless you count his “under five” bit part as “Assistant” in Joel Schumacher’s notorious “Batman Forever.” It certainly is a change from small independent films like Favreau’s career-making acting and writing debut, “Swingers,” which he compared to throwing a party and hoping people would come. Reports are circulating that actress and singer Brittany Murphy, best known for roles in films like “Clueless,” “8 Mile,” and “Sin City,” died early this morning from cardiac arrest at Cedars Sinai Hospital in Los Angeles. She was 32 years old. Of course, the item is already fomenting speculation in the more gossipy realms of the Internet. Danny Groner of the Huffington Post points out that she was recently left the cast of “The Caller” under what definitely appears to be a real cloud and was the subject of an unfunny SNL parody. The Chicago Tribune report I linked to above also mentions “reports” that she might have been fired by her agent. On the other hand, as Nikki Finke points out, she has several other films completed that are currently in post-production. When someone that young dies of a heart attack, people are naturally going to wonder about possible drug issues, and I’m sure those who follow the gossip sites will be getting their fill of the details in coming days. Quite honestly, this is the kind of post I hate to write. It’s just terribly sad and there’s probably not that much more to be said about it. I hope more comes out of her to-be-released film work than fuel for schadenfreude mongers. UPDATE: Nathaniel R. has some thoughts on Brittany Murphy that are worth your time. Still “Clueless” after all these years! AskMen.com has announced its 9th annual list of the “Top 99 Most Desirable Women,” and, man, did their readers come out in droves to make their opinions known. More than ten million votes were cast in this, the site’s ranking of women who best represent the qualities of the ideal girlfriend or wife, but since this is Premium Hollywood, we thought we’d take a gander at a handful of the list’s actress inclusions and offer up a few of our favorite film and TV appearances by these women. Best Work: The obvious pick here is “Lost in Translation,” of course, since it’s generally considered to be Johansson’s breakthrough performance, but she also received a great deal of praise for her turn in Peter Webber’s “Girl with a Pearl Earring.” With that said, however, let’s not forget about her work for Terry Zwigoff in “Ghost World,” which was strong enough to earn her the long-term career that her co-star, Thora Birch, was unable to maintain. Guiltiest Pleasures: “The Perfect Score.” It’s a spiritual descendant of “The Breakfast Club,” but while it’s in no way as good as that John Hughes classic, it’s a pleasant teen comedy with a nice ensemble cast. Also worth catching on a rainy Sunday afternoon is “Eight Legged Freaks,” a slight but fun throwback to ’50s sci-fi monster flicks. A Must to Avoid: “The Spirit.” 50,000,000 movie critics can’t be wrong.